ST. GEORGE — As part of the 40th annual St. George Art Festival this weekend, St. George Dance Company will be presenting the “Kinetic Gallery Spring Show” at the Electric Theater on Friday and Saturday at 7:30 p.m., with a Saturday matinee at 2 p.m. A preshow will feature guest artists from On Stage Dance Studio, Vista Arts School and Alight Dance Academy. St. George Dance Company is celebrating the thriving arts community that exists in Southern Utah by showcasing professional performing artists who represent the most fleeting of all the arts, said Becky Reed, artistic director for the company. 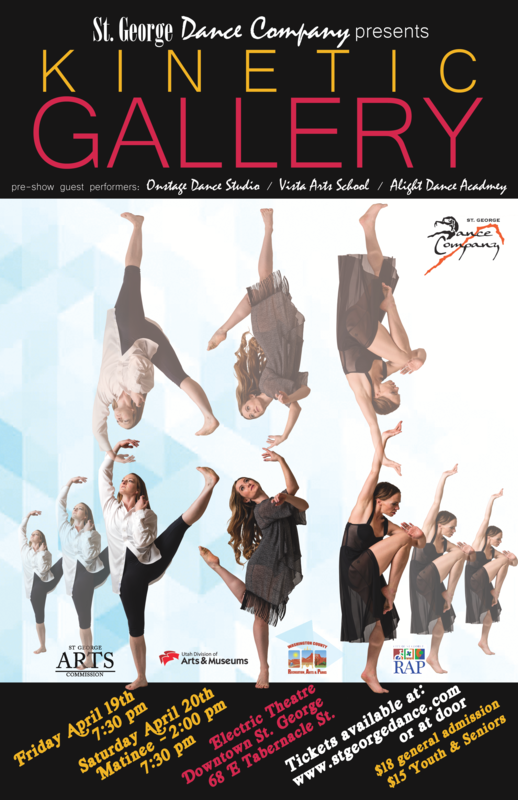 St. George Dance Company Executive Director Sherlynn Davis described the Kinetic Gallery Spring Show as being similar to an art gallery featuring different mediums; each piece in the show has a different energy. “Like good art, it crosses mediums and encourages artistic expressions in many forms,” Davis said, adding that one of the things patrons will notice about the performances is that they put art back into dancing, rather than just focusing on tricks and thrills. Both Davis and Reed said they believe the show will inspire the audience to tap into their creative side. “To be creative is something that is inside each of us,” Davis said. St. George Dance Company was founded as the first professional dance company in the area 11 years ago by Summer Belnap Robertson, with the company providing quality performances to the community throughout the past decade. Now under a new administration, Reed said the company and its leaders hope to continue the work of Robertson and further establish a community of professionals that represent the quality and diversity of the community and its artists. “We want to bring those that love dance a home,” she said. When: Friday-Saturday, April 19-20, 7:30 p.m.; Saturday matinee, 2 p.m. Cost: Adults, $18; youth (18 and under) and seniors (60 and over), $15. Purchase 10 tickets for $120 ($12 each). Tickets can be purchased at the door, online or by calling 435-668-5727.